When the camera isn’t used for 5 minutes while the power was turned on, all the lamps automatically turn off and the camera enters an energy saving state. The camera can be reset to the, “power on” state by hitting the shutter release button or pushing and pulling the lens section. The Pic-300 uses four AA batteries (must be the same type and size of alkaline batteries). 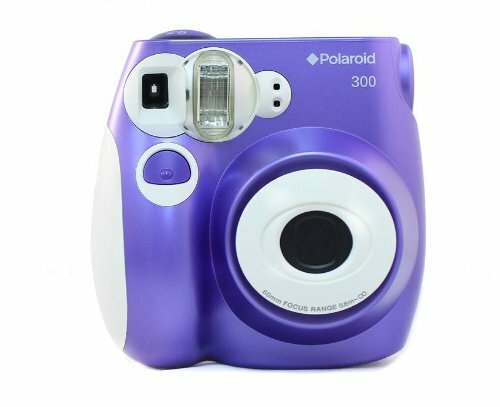 Polaroid Pic-300 Instant Camera Features a Easy and fun to use To use, simply snap, print, and share your photos - that's it! Take it on the go so you can send friends and family home with pictures of their own within minutes. The film counts down like a disposable camera so you know how many pictures are left before you change the film. Taking a picture in all light settings When the camera isn't used for 5 minutes while the power was turned on, all the lamps automatically turn off and the camera enters an energy saving state. The camera can be reset to the, "power on" state by hitting the shutter release button or pushing and pulling the lens section. The Pic-300 uses four AA batteries (must be the same type and size of alkaline batteries).